The Ford Thunderbird was one of the first U.S. vehicles to use the Brazilian design of the Ford turbo assembly. European car owners were the first to know about the power of a turbocharger in Ford automobiles. After the rise in sales in the early 80s in the U.S., Ford decided to implement this technology into their domestic cars. Both automatic and manual transmissions were used with the Ford 2.3 turbo. While no trucks during this time used this technology, many passenger cars benefited from the boost of power that the 2.3 turbo provided. We have the Ford 2.3 turbo in stock and ready to ship inside the U.S. and Canada. Some Mustangs used the turbocharger. Not every vehicle used the intercooler design, but all benefited from the extra boost in performance and power. Models such as the Pinto, Capri, Mustang II and Mercury Cougar are no longer in production, but there are plenty of owners that know what these cars can do with Ford 2.3 technology. We buy turbos from reputable dealers. 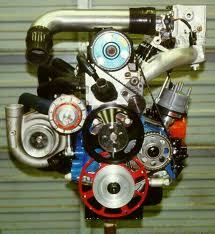 What you will find in our inventory is inexpensive replacement Ford turbos. We make it easy for you to replace an existing turbo or upgrade your existing one. If you are buying from other dealers online, we know you are paying too much. Our entire staff of engine experts know Ford engines inside and out. Every component installed contributes to the total horsepower that is achieved. We buy turbos and recondition them to make them like new. It is easy to spend thousands of dollars buying a new turbocharger. We cut that price way down for you when you purchase one of our rebuilt Ford turbos. The entire rebuilding process takes place in our technologically advanced engine shop. We have an entire staff of engine specialists that do nothing all day except rebuild turbos for sale. We offer you a low price, but our offerings do not stop there. Every Ford 2.3 turbo that we sell comes with our extended warranty. This means you are fully protected from any type of damage that might occur within a 3-year period. Every part that we replace or rebuild is warranted against breakage or failure. Instead of buying a used Ford turbocharger, you are getting one rebuilt from us and it will be guaranteed to work just as good as a new one. Many of our customers appreciate the fact that they can save money and still have the peace of mind of a partner working just for them. We will give you our low price when you call 1-866-244-4905. We won’t waste your time. We know why you’re calling. If you want an online quote, getting one is just as easy as a phone call. Complete our easy to use quote form. Our low price will arrive to your email for you to review. When you are ready to order, contact us by email or by phone. We ship out Ford 2.3 turbochargers the same day that they are ordered. This eliminates shipping delays and gets you a turbocharger faster.